Remember how much fun it was to swap between characters in The Lost Vikings, using their unique abilities to overcome obstacles and/or enemies in that classic platformer? Well, even if you don’t, that’s quite alright. It’s just that this very mechanic sits at the core of the Trine trilogy, the wizard, knight and thief each bringing a unique set of tools to its puzzle-filled worlds – in a really fun way. Much like the viking trio, this particular lot is also playable in co-op, each taking control of… well, whichever character they want (can be changed/restricted in the settings, prior to starting). And let me tell ya, speaking from experience, having two wizards makes puzzles borderline trivial at times, so probably best to not enable such nonsense unless you don’t care much for a challenge. Just saying. Spellbound by the magical object Trine, the heroes must join forces to overcome obstacles and puzzles in a fully interactive physics-based world, battle the undead and their minions, and restore balance to the kingdom! Anyway, each of these conversions/ports are being handled by BlitWorks and, like prior releases, will feature both local and online multiplayer, the Switch edition throwing “local wireless co-op” in as a neat little bonus. Aside from that though, I suspect very little will differ between versions of either title; save for perhaps the frame-rate, which is capped at 30 both docked and undocked. In other words, all the color magic and chaotic platforming – especially with a full party of three – remains intact, lots of puzzles to overcome, enemies to annihilate and collectibles to, well, collect. Good stuff. Trine Enchanted Edition is available on Switch, carrying a $14.99 price tag. 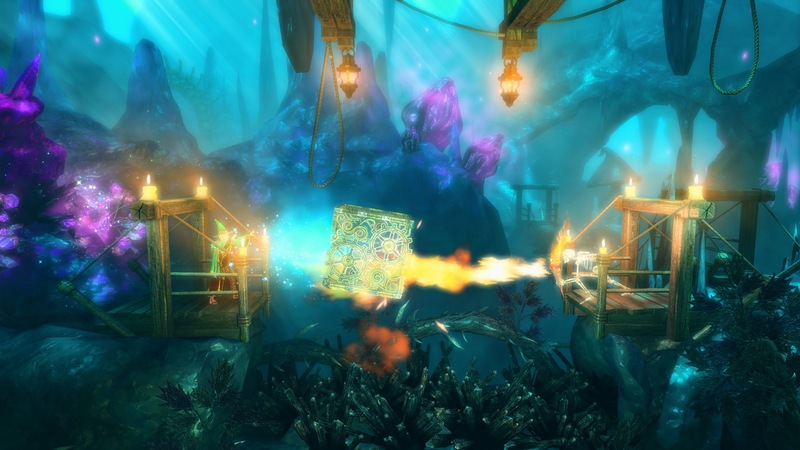 Trine 2: Complete Story and Trine 3: The Artifacts of Power? Right around the corner.